Jira is a project management software that is quite popular among many companies. With a really high score of 9.4/10 and user satisfaction at 99% it is currently one of the best project management solutions reviewed on our site. The first place in this category is held by Wrike which has a total score of 9.8/10 and is the winner of our Best Project Management Software Award for 2018. You can try out Wrike for free here. You can also compare Jira with Wrike and see which one is better for your company. Jira is designed to help users capture, assign, and set priorities to their work. It allows you to manage the whole process of application development making sure that all things are covered, from concept to launch. Its simple, intuitive interface enables collaboration with teammates and allows you to get the job done in an effective manner. To be qualified as one of the most powerful project management and collaboration-equipped systems of today, Jira brings on the table a multitude of unique features and functionalities. The platform can simultaneously be used for both internal and external project management, agile tracking, and software development, and has served over 40,000 international businesses during its 15 years of market excellence. Jira was projected as an agile system, able to meet the needs of different niches and industries. Driven by such intent, it evolved over the years into a highly customizable and feature-rich solution that uses a hybrid Scrumban approach which combines Scrum and Kanban to adapt to every user scenario. With Jira, all your workflows, states, fields, and issue types will get sensible defaults you can change upon need, or even create custom workflows and issue schemes in more specific cases. This will take much of your developers’ burden off their shoulders, and empower your project management units to maximize the potential of their idea. If you’re using Jira on demand, configuration will take even less time. It goes without saying that a system empowered for manipulation sets the grounds for proficient project management, but one still has to dig into details to understand everything Jira can do. The system deals predominantly with agile project management, adopting both a Scrum and a Kanban approach (Scrumban), and captures data and regulatory evidence at every stage of the process. A beneficial hint you will discover along the way is active engagement for your entire team, as Jira gives everyone the whole picture of the processes they’re involved in, and lets no issue falls through the cracks. As a matter of fact, team members receive instant notifications on matters that are of interest to them, and are able to communicate, share ideas, and attach important documents. Jira collects and unites all historic data in a single, searchable hub, and provides access to it at any point of time. This way, team members will be able to perform all sorts of rend analysis and statistical investigations, and prepare constructive reports on their progress. A dozen of out-of-the-box templates will be displayed to get the job done with minimal interference, but the user won’t be obstructed from crafting his own custom summaries. While it is true that Jira is mostly appreciated for issue and bug tracking, those are far from being the only features you should know about. This system will become your developers’ favorite assets before you know it, as they will get a dedicated Jira Query Language (JQL) to create all filters and manipulations in less than no time. For instance, Jira can be connected to BitBucket and GitHub to provide backlog-to-deployment traceability, and new workflows can be created to synchronize the different practices users employ to build, test, and release their applications. The robust set of APIs will also come handy to connect Jira to third-party software, and obtain the exact data migration patterns you’ve envisioned. Depending on their current software infrastructure, Linux and Windows installers are offered for the OnPremise solution, but they can also opt for the hassle-free and minimum maintenance Jira OnDemand. As your preferences change, you can easily switch between the OnPremise or OnDemand packages. 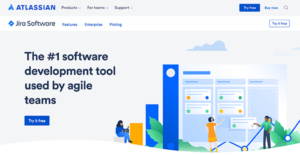 Extending Jira’s power and making it work in line with your business specifications will be more than easy, as developers provided you with flexible REST and Java APIs, as well as 800+ add-ons and plugins available in the Atlassian Marketplace. This makes Jira perfectly capable of blending into your software environment, and ready to run as soon as you’ve created your account. Jira is ideal for large and remote teams working on a variety of locations, as it comes with native mobile apps that keep Android and iOS users connected. The apps are just as powerful as the desktop and on premise version of the system, which means you can use them to complete all tasks and operations, and access all data available in your database. It's crucial to realize that virtually no app in the Collaboration Software category will be an ideal solution that can match all the needs of various company types, sizes and industries. It may be a good idea to read a few Jira reviews first as certain services can excel just in a really narrow group of applications or be prepared with a very specific industry in mind. Others can operate with an idea of being easy and intuitive and as a result lack advanced functionalities needed by more experienced users. You can also find apps that focus on a large group of users and give you a powerful feature set, but this in most cases comes at a more expensive price of such a service. Ensure you're aware of your requirements so that you get a solution that provides specifically the elements you look for. We realize that when you make a decision to buy Collaboration Software it’s important not only to see how experts evaluate it in their reviews, but also to find out if the real people and companies that buy it are actually satisfied with the product. That’s why we’ve created our behavior-based Customer Satisfaction Algorithm™ that gathers customer reviews, comments and Jira reviews across a wide range of social media sites. The data is then presented in an easy to digest form showing how many people had positive and negative experience with Jira. With that information at hand you should be equipped to make an informed buying decision that you won’t regret. What are Jira pricing details? What integrations are available for Jira? Pros: The way we can create workflows to manage an agile development project is really cool. The dashboard really specifies a quick look to conduct scrum for a current sprint. Cons: nothing, really like this. Pros: I honestly can't think of any pros at this point. I've used it a handful of times, and every time I'm in the product it's confusing, overwhelming and doesn't provide a way to simply track tasks or sprints. Cons: The todo functionality is so confusing that I have yet to even figure out how to mark a task as "complete". How could they get something that simple wrong? The way we can create workflows to manage an agile development project is really cool. The dashboard really specifies a quick look to conduct scrum for a current sprint. The first thing I like about Jira is its simplicity. It's well built with a modern and intuitive interface that makes using it very easy. If you need more information about Jira or you simply have a question let us know what you need and we’ll forward your request directly to the vendor.